Attendance at the 31st annual Suncoast Boat Show jumped 17 percent and exhibitor revenue increased by 9 percent, according to the producers of the show. The event, held April 19-21 in Sarasota, Fla., featured a combined 155 new and used boats in the water — an increase from 133 last year, according to Show Management. In addition, the number of exhibitors increased 2 percent. There were more boats on land this year, compared with last year, but specific numbers were unavailable. The number of new boats displayed in the water increased by 25 percent, with the brunt of that increase consisting of boats under 45 feet. This year there was a 28 percent increase in new boats under 45 feet in the water. Some boat dealers and manufacturers characterize Suncoast as a small show, but one with fewer tire-kickers. This was the first Suncoast show for Scott Hanson, owner of Rossiter Boats in Ontario, Canada. Jupiter Marine showcased its new 41 express sportboat with triple 350-hp Yamaha outboards and Helm Master joystick helm control. The company, known for its open fishing boats, prior to the show sold hull No. 1, and hull No. 2 was for sale in Sarasota for $734,000 retail. 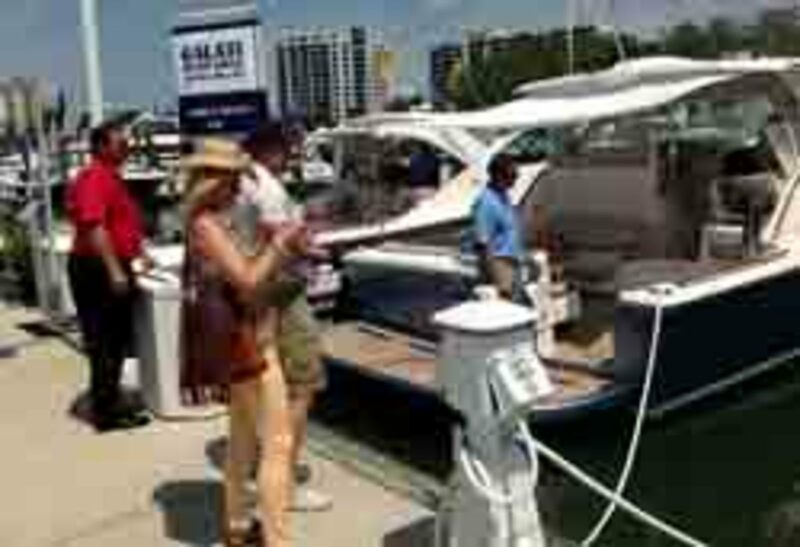 Recent enhancements to the MyBoatShow smartphone app — designed to help explore the show&apos;s docks, land tents and transportation — helped showgoers navigate their way around the event, which was held at Marina Jack on Sarasota Bay. The show is produced by Show Management, which is owned by Active Interest Media, the company that owns Soundings Trade Only.